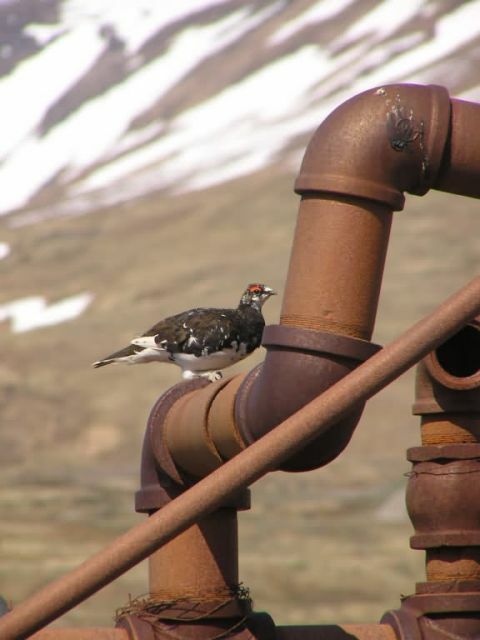 2005, Ptarmigan on WWII relics The EvermannÃ¢â¬â¢s Rock Ptarmigan project is helping to restore natural biodiversity in the Aleutians. Fourteen subspecies of rock ptarmigan are found in North America with seven of the fourteen subspecies occurring in the Aleutians, and six of these occurring on only one or a few islands. Evermann’s rock ptarmigan (L. m. evermanni) is an endemic subspecies and is recognized as a "species of special management concern" by the U.S. Fish and Wildlife Service. Arctic foxes, introduced for fur production, eliminated ptarmigan on all but Attu. Bering Island, which is 300 miles to the West of Attu, supports another subspecies (L. m. ridgwayi). Ptarmigan were reported on Agattu Island by the local Aleuts before 1886 but were not found there by Olaus Murie in 1936. Agattu is 27 nautical miles southeast from Attu Island’s Massacre Bay, and is second only to Attu in size within the Near Island Group. This project is designed to restore the population of EvermannÃ¢â¬â¢s Rock Ptarmigan on Agattu Island by translocation from Attu.